Over the past few weeks I've been doing a major amount of Christmas decoration shopping because this year I'm changing up my decor theme to be a bit more eclectic and playful! I'm super excited about this and have found some amazing decorations that I really wanted to share with you before everyone goes and puts up their Christmas tree. I also have a few random items that can be dotted/hung around the home for an extra festive touch. 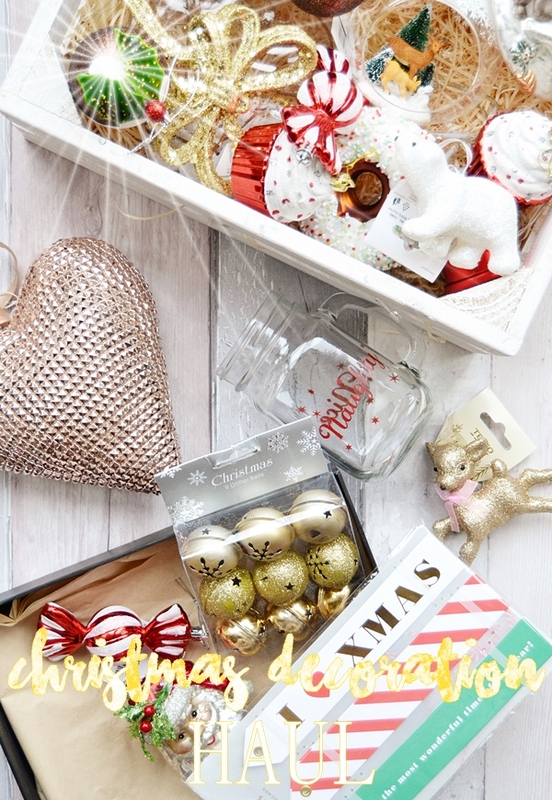 P.S I loved photographing all these amazing decorations; I'm currently feeling soooo festive! Each year my first stop for all things festive is Homesense (and then TK Maxx) as it literally feels like Santa's grotto in there for Christmas decor and gifts. As I mentioned this year I want my Christmas tree to have an eclectic feel to it but without being full on tacky, so Homesense was the perfect place to find some quirky yet vintage style tree decorations. Yes, TK Maxx and Homesense are a little pricey for individual tree decorations at around £2.99-£3.99 each but they really are baubles that you will treasure and keep for years to come I think. 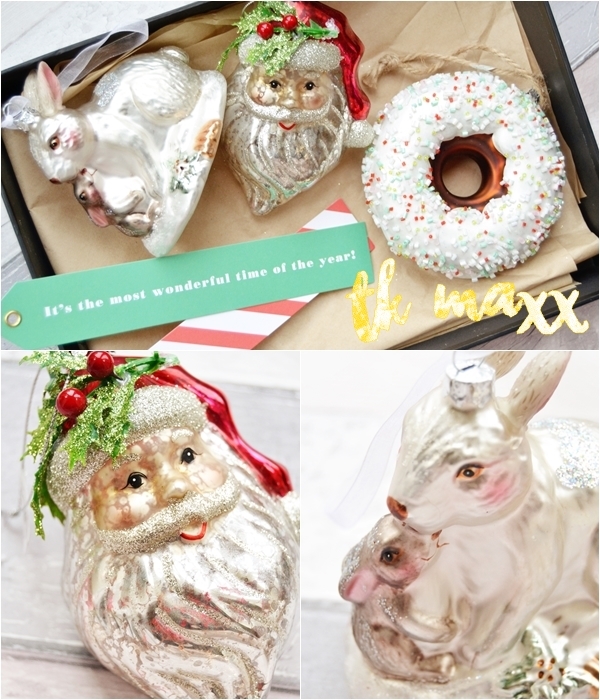 What I picked up - Vintage Santa £2.99, Mother Rabbit With Bunny £2.99 and a donut £2.99. I also picked up a set of 6 gift tags for £2.99... again a little pricey but I couldn't resist them! And the below rose gold studded heart (from Homesense) for £3.00, which I plan to hang from a door handle. For the longest time I wasn't aware of The Range and somehow it is one of those stores that a lot of people haven't heard of. I haven't a clue why as they have some pretty big stores full of amazing homeware, arts & crafts and children's toys. Each year come November they also turn half of the store into a haven of all things Christmas-y and it's just wonderful! They have aisle after aisle of stunning baubles all colour grouped and I really believe they are just as good as the baubles found in the likes of John Lewis and Debenhams but at a fraction of the price! Though I did manage to be restraint and only picked up two Christmas tree decorations. 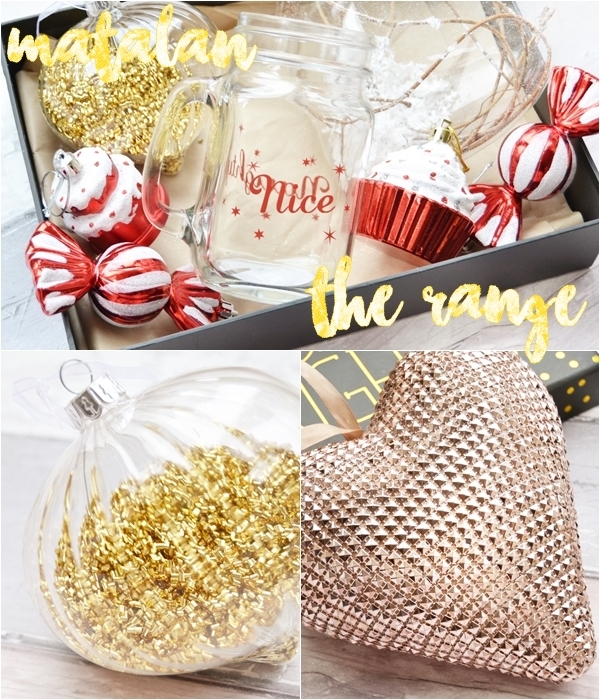 What I picked up - Gold Glitter Bauble £1.59, Large Heart with snowy branch £2.99, also the below gold jingle bells (pack of 9) for only £1.00! From Matalan I picked up - Naughty or Nice? Mason Jar for £3.00, perfect for hot chocolates with whipped cream! Lastly I doubled up some Tesco Clubcard points I had and couldn't resist in buying quite a few of their Christmas tree decorations that are just so adorable this year. They are also on 3 for 2 making them so affordable. 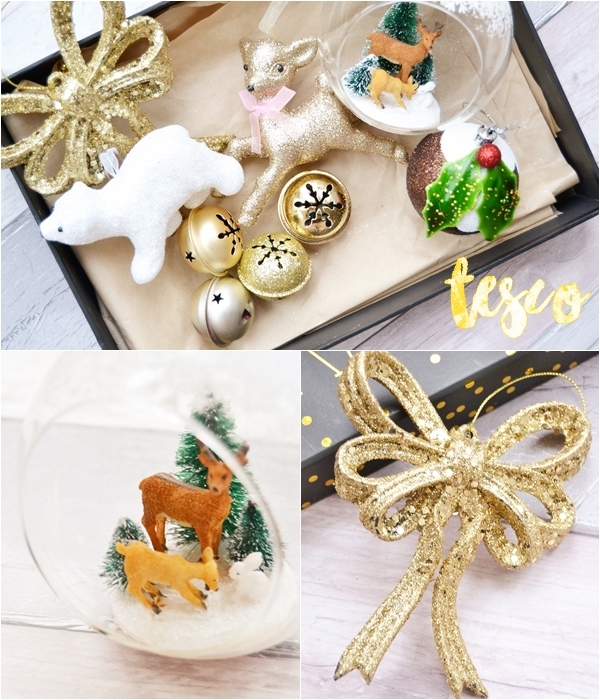 What I picked up - Glass Reindeer decoration £3.50, Gold Glitter Fawn £1.50, Polar Bear £1.50, Gold Glitter Bow £1.50, set of 3 Christmas Pudding baubles £1.50. I'd love to know your favourites from what I picked up and where you like to go Christmas decoration shopping as I'm still a few more bits and bobs!